During my education to become a Wilderness Guide, I was in need of a pair of binoculars for bird watching and nature observation. 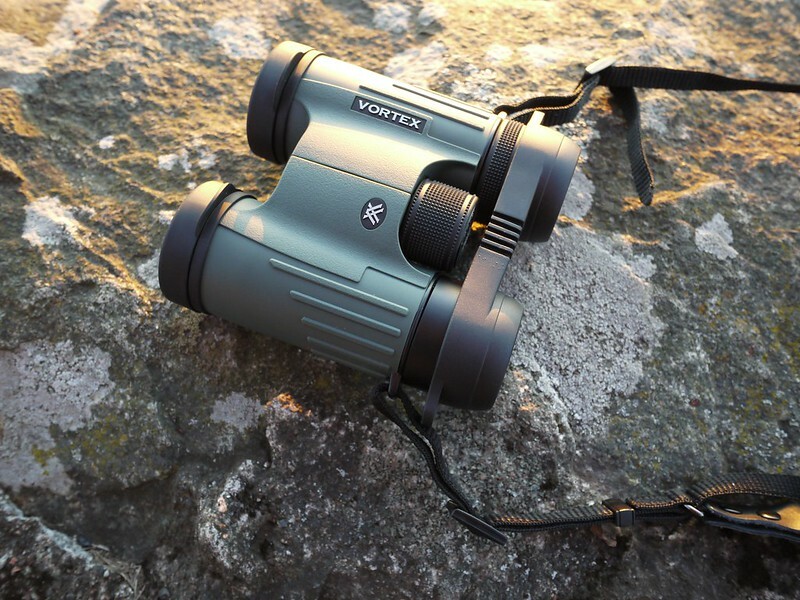 While there are plenty of companies who make high quality binoculars, I ended up with a pair of <a href=”http://www.vortexoptics.com/product/vortex-viper-hd-8x32-binocular”target=”_blank”>Vortex Optics Viper HD 8x32 Binoculars</a>, which were for me the best combination of quality, weight, and viewing. You might wonder why I got a pair of binos instead of a much lighter and smaller monocular. This is mostly because the binos came on trips where I was working as a Guide and birdwatching trips, where weight and size were of less concern. A pair of binos is just much easier to handle for a client, because they’re familiar with how it works: Hold it to both your eyes, adjust and see. 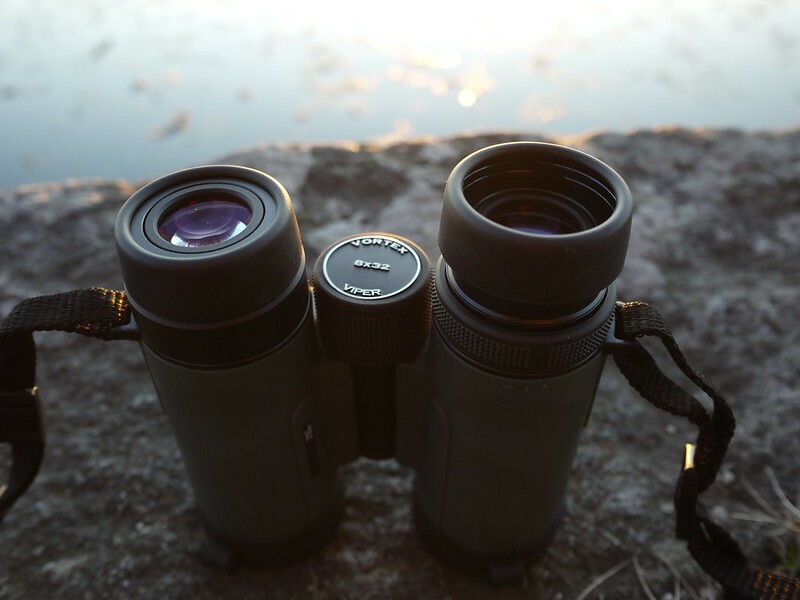 Being able to hand your client a good pair of binos, which allows them to see that Black Woodpecker you just spotted, is making their experience just so much better. Also for kids a pair of binos is much easier to use, as they can hold it with both hands to their eyes, allowing for a more stable view (the same goes for adults, obviously =). It is very rewarding to see their faces light up when they look through the glass and see that bird you just pointed out to them! So yes, binos. The Viper HD uses roof prisms, which allow for a more compact and narrow design. To counter the reduced light transmission this design has (in comparison with Porro-prisms), Vortex has developed and applied a bunch of very smart features. Multi-layer coatings provide the clearest, brightest, most color-accurate images possible, while XR anti-reflective coatings increase light transmission for maximum brightness. Phase Correction enhances resolution and contrast, and HD extra-low dispersion glass deliver an impressive resolution and color fidelity, resulting in High Definition images - that’s what they claim, and what I can confirm. Add in that the fixed alignment in roof-prism designs means the binoculars normally won’t need re-collimation (re-aligning of the prisms), and in the long-term you’re possibly even saving money. The Viper binos are waterproof and fogproof; while I haven’t submersed them to test the former, the fogproofness has been tested on countless occasions. The exterior lenses have an ArmorTek coating, which makes them less prone to scratches, oil and dirt - not that I’m carrying them around carelessly, though it is good to know that when by accident they’d drop on the ground, or in a stiff breeze at the beach, they’re protected. The rubber outer provides a non-slip grip, and also gives you the durable external protection you want. All this high-tech and durability obvious comes at a cost. At 663 gram, including tethered objective lens covers for both ends and the Comfort neck strap, I don’t consider the Viper ultralight, but it is still one of the most durable & lightest binos on the market. While the 90 gram of the padded carrying case aren’t really necessary (it are very rugged binos), it is a good extra protection. So much for the tech and weight of the Viper HD binos; but how are they in use? After almost a year of using them in various situations - from a <a href=”http://www.hikinginfinland.com/2012/01/archipelago-national-park-trip-report.html”target=”_blank”>bird watching trip in the Archipelago</a> to <a href=”http://www.hikinginfinland.com/2011/09/upitrek-family-trip-guiding.html”target=”_blank”>using them at work guiding clients</a>, they always have been dependable, delivering sharp views on far away wildlife. 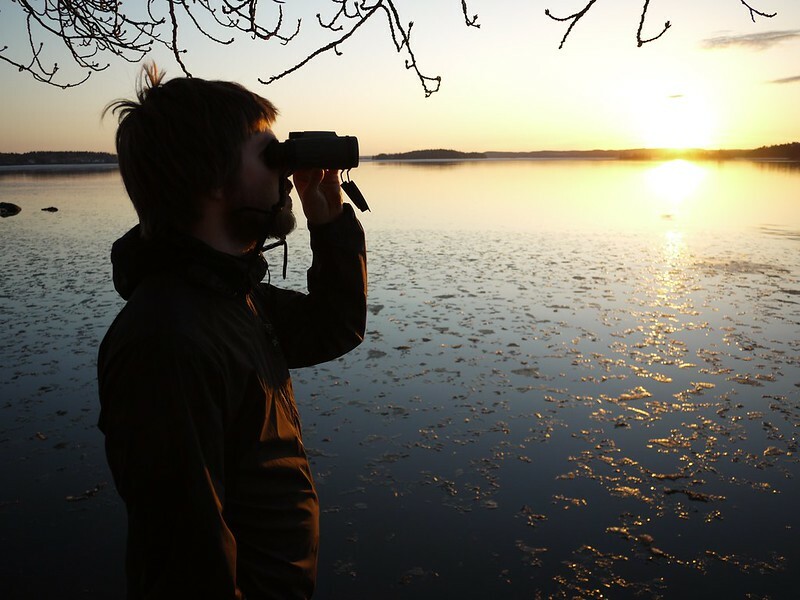 It is especially when outside with clients a very useful tool, because a good pair of binoculars that you can give your client in the hand, allowing them for example to see that White-tailed Eagle sailing high above you, is something that will help make their outdoor experience much more memorable, if not unforgettable. The twist eyecups help here to allow for a comfortable custom fit when looking through them, and with the very easy to use Diopter people can quick & easy adjusts for differences in their eyes. The Center Focus Wheel of the binos lets one quickly adjust the focus, and even kids know immediately how to use them. The Viper easily adjust in the middle to different widths so that they also work perfectly for kids. A highly functional pair of binoculars, made for the outdoors, for observing wildlife and looking far away, in a small, compact and reasonably light package. At < $500 they’re not cheap, but you invest into a high quality piece of kit that your kids can inherit. And should something go broken, then Vortex’s <a href=”http://www.vortexoptics.com/content/vip_warranty”target=”_blank”>VIP Unconditional Lifetime Warranty</a> has you covered. 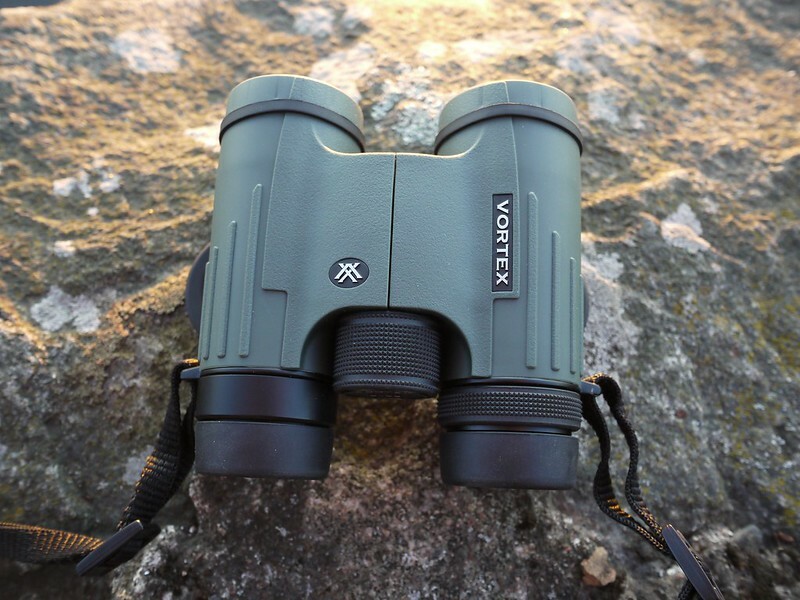 If you’re in the market for a pair of binos, I can highly recommend the <a href=”http://www.vortexoptics.com/category/viper_hd_binoculars”target=”_blank”>Vortex Optics Vipers</a>. More <a href=”http://www.flickr.com/photos/hendrikmorkel/sets/72157629725133384/”target=”_blank”>photos on Flickr</a>. I had a pair of the discontinued Viper 8x32 binoculars on loan for this interview, the Viper HD 8x32 is the successor to this model.